Surveillance imaging has become an increasingly important topic in pediatric oncology. More children than ever before are now alive at 5 years from the time of diagnosis. With the number of cancer survivors growing each year, we are faced with the unique new challenge of determining how best to monitor these patients for disease recurrence. There has been increasing discussion related to how frequently surveillance imaging should be performed, with which imaging modalities, and whether aggressive surveillance imaging recommendations are justifiable in terms of the risks associated with frequent imaging and whether early relapse detection results in improved clinical outcomes. 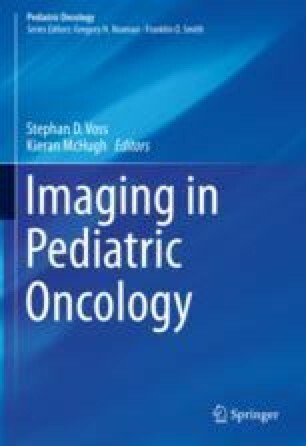 This chapter will focus on the growing body of literature related to the role surveillance imaging plays in the care of patients with a variety of common pediatric malignancies. Evidence-based recommendations, where available, will be presented along with considerations for the appropriate use of imaging as an essential element of a comprehensive end-of-therapy monitoring plan. Marcus PM, Prorok PC, Miller AB, DeVoto EJ, Kramer BS. Conceptualizing overdiagnosis in cancer screening. J Natl Cancer Inst. 2015;107(4) https://doi.org/10.1093/jnci/djv014. Mullen EA, Chi YY, Hibbitts E, Anderson JR, Steacy KJ, Geller JI, Green DM, Khanna G, Malogolowkin MH, Grundy PE, Fernandez CV, Dome JS. Impact of surveillance imaging modality on survival after recurrence in patients with favorable-histology wilms tumor: a report from the Children’s Oncology Group. J Clin Oncol. 2018;18:JCO1800076. https://doi.org/10.1200/JCO.18.00076. Shelmerdine SC, Roebuck DJ, Towbin AJ, McHugh K. MRI of paediatric liver tumours: how we review and report. Cancer Imaging. 2016;16(1):21. https://doi.org/10.1186/s40644-016-0083-3. Rothermundt C, Whelan JS, Dileo P, Strauss SJ, Coleman J, Briggs TW, Haile SR, Seddon BM. What is the role of routine follow-up for localised limb soft tissue sarcomas? A retrospective analysis of 174 patients. Br J Cancer. 2014;110(10):2420–6. https://doi.org/10.1038/bjc.2014.200.